This summer is gearing up to be rather a nice one and when temperatures go really high, there is nothing quite like being by the water. A walk along the brown Thames is possibly not the most inviting, but London’s waterways offer plenty of chilled out and/or adventurous ways to explore the city. For the sporty ones among you, exploring London’s canals by kayak will make you see the city from a whole new perspective. 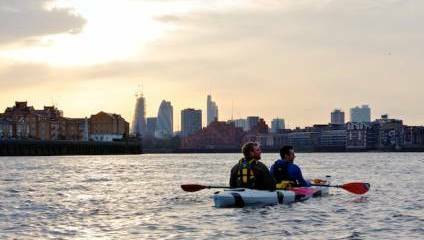 Moo Canoes are located in Hackney, Limehouse and Poplar and rent tandem kayaks for individual adventures as well as guided tours. You can pick a casual 2 hours trip along Regent’s Canal, a mini taster session around the Olympic park, a 4 hour paddle picnic in Victoria Park, or go all out and do a full day in the wild nature reserve around the River Lea. The best thing is after paddling past all those cute canal cafes, you will certainly have earned your lunch. Commendable folks may book one of the monthly canal litter picking tours and help keeps the waterways clean. Moo Canoes are located at Limehouse. Kayak hire is £30 (2 hours) / £45 (4 hours) and canoe hire is £40 (2 hours) / £60 (4 hours). Slightly less sporty but all the more romantic, you can get a pedalo boat or rent a good old-fashioned rowboat in many of London’s parks, including Regent’s Park, Victoria Park, Finsbury Park, Alexandra Palace, Battersea Park and the Serpentine in Hyde Park. Now is a great time to take to the water to get a glimpse of all the water birds and their chicks. Or just take a straw boater and a picnic and pretend you are in a Victorian novel. Boating prices vary from about £10 - £20 per hour. Combining two winning elements, cruising and drinking, London’s first Gin cruise Gin on the River will go on its maiden voyage on Thursday 7 June. Passengers will enjoy a tranquil three-hour cruise around the Olympic Park and East London canal network, while sampling some of the most exquisite gins from around the world. Gin lovers will learn about the most en-vogue drink of the moment, and the story and tasting notes behind each of the gins on board. After sampling the gins, passengers will also be able to enjoy two cocktails each, and keep the Gin on the River custom glasses afterwards as a souvenir. With only 24 seats on board, tickets are limited but don’t worry, this will definitely not be the last Gin Cruise this summer. Sails will be set at 6.30 pm and the cruise will take off from the Pontoon on the canal, Queen Elizabeth Olympic Park. Tickets are £75.00 and can be booked here. If you are looking for something seriously fancy, The Sunborn London super yacht hotel launched a pop-up champagne deck for summer, in partnership with Laurent-Perrier. You can sip specially created champagne cocktails alongside bespoke canapés in an elegant outdoor setting on the top deck overlooking London’s scenic city skyline. Moored in the Royal Victoria Docks, the sleek yacht offers breath-taking views across the London cityscape, with sophisticated interiors drawing upon classic sailing glamour. The prohibition-era inspired Laurent-Perrier champagne deck will transport guests to the French Riviera, while remaining in the heart of London. The pop-up will run from 27 April – 3 September and will be open daily from noon-10pm, welcoming hotel guests and visitors alike. For real adrenaline junkies Thames RIB Experience are offering a thrilling high powered speedboat ride down the Thames. Tours last between 20 minutes and an hour and there are various routes to choose from. If you’ve ever wanted to be Daniel Craig – and if you have the cash - you can book the Ultimate MI6 Spy Experience and power your way along the River Thames while a trained guide will tell you fascinating anecdotes about the life and times of author Ian Fleming and his most famous creation of all – James Bond. Hold on tight as the skipper opens up the engines and you can pretend to be a top secret agent as the boat speeds off down towards the O2 playing the Bond theme. For Queen and country! Thames RIB Experience start from £26.50. The Ultimate MI6 Spy Experience is a charter booking for £545.